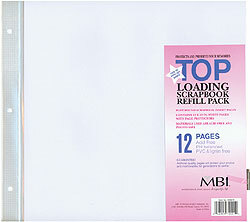 Top-loading three hole 12x12 sheet protector pages with white acid free paper inserts. Includes 6 sheets (12 sides) and extension posts. Plastic sheet protectors with white acid free inserts fit MBI and other 12x12 post bound scrapbooks.